The Max Pashm sound is a unique blend of traditional Greek/Balkan/Gypsy & Klezmer music, fused with high energy electronic beats & digitally manipulated fx. Sunday, December 18 at 2 PM - Music, poetry, wine, festivity! Experience the vibrant environment of an early 20th-century Lower East Side wine cellar. Musicians Peter Rushefsky, Jake Shulman Men, and Jeffrey Wollock and poets Celena Glenn and Bob Holman pay tribute to the sweet gypsy sounds and improvisational poetry once featured at these popular gathering places. The Eldridge Street Project's Wine Cellar Cabaret will take place at the Eldridge Street Synagogue, 12 Eldridge Street (between Canal and Division Streets). By subway: F to East Broadway; B or D to Grand Street. Admission: $18 adults; $15 students and seniors. For more information, please call the Eldridge Street Project at 212.219.0888 x 302. Friday, April 28th, 2006 @ 7pm til? Bring a picnic or pick up some food at one of the vendors. Wander between the stages or just sit on a blanket and listen to the music. 10pm (SSP! at midnight) with Pandemic DJ Pete Spynda! We're playing a show with the Mama Digdowns. This should be a fun night of brass banding! Frank London's Klezmer Brass Allstars and Balkan Fantasia from New York will play for your ecstatic booty shaking pleasure. Back by popular demand - Ljova and the Vjola Contraband returns to Joe's Pub for a return engagement, sharing the bill with friends and bandmates Romashka! the most innovative musicians in Klezmer and Jewish-inspired music." Foot-stomping five-piece Scottish band Moishe's Bagel arrive at St George's Bristol for an evening of lively, jazz-influenced klezmer and Balkans music. An intoxicating mix of Eastern European dance music, Middle Eastern rhythms and virtuoso performances. After romping their way into our hearts during Community Music Day, the Fishtank Ensemble relocated to LA last month. Luckily for us, they're making their way back to the Bay to play at La Pena. Don't miss out on what LA Weekly describes as "one of the most thrilling live acts on the planet." Visit the Fishtank Ensemble website for more info, www.fishtankensemble.com. 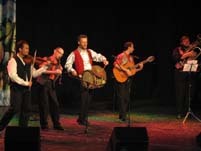 SUNDAY, JUNE 24th, 7 PM: ÜSZTÜRÜ, a ten member ensemble of traditional Hungarian musicians and dancers from Transylvania in a concert and Tanchaz/ dance party in the Beck Center Armory Beck Center. Call 216-521-2540 for tickets ($12 students, $17 adults). Don’t miss it! in pgh polish hill area. Direct from Berlin, Daniel Kahn, likened to the young Bob Dylan, hits nerves as he juggles sensibilities in the one-night only showcase of Jewish music that rides the edge on Sunday, November 18th at Amnesia in San Francisco. Joining him are the blazing Fishtank Ensemble, now based in Los Angeles, and the Bay Area's own brilliant nerdie-commie-girl band Charming Hostess. December 5th we make our debut at Ashkenaz in Berkeley where we will be sharing the evening with the local Greek Rebetica band Smyrna Time Machine. Ashkenaz has a great dance floor, so we expect your bootaaaaaaaaays to be shakin'. Zoyres Eastern European Wild Ferment with Sandor Elix Katz! Admission by donation; no one turned away for lack of funds. Bring a jar to fill, some veggies to chop, a cutting board, knife, and grater. 10 P.M to 1 A.M.
Wednesday, Feb. 27, at the Lewiston, ME Public Library. The free public event will take place from 7 to 9 p.m. in Callahan Hall on the library's third floor. if you're out in Oak Park stop by the tent at the corner of Marion and Lake where we'll be animating the Downtown Oak Park Shop 'n Dine, 6 to 8:30 pm. known collectively and alliteratively as the BROTHERHOOD OF BRASS. AND CELEBRATE MARKO MARKOVIC'S WEDDING PARTY!!! Festive gypsy brass band Boban i Marko Markovic Orkestar ignites an "unbeatable Balkan dance party" (Songlines) in the Kimmel Center's Perelman Theater on Thursday, July 24, 2008 at 7:30pm. Hailed as the greatest of Balkan trumpeters, Boban Markovic, the legendary native of Serbia's gypsy brass heartland, has led his 13-piece Orkestar to international acclaim, enhancing the traditional repertoire with elements of jazz, Latin and pop, among others. Boban and his son Marko lead the Orkestar into new directions with their trail-blazing musical mix, which the New York Times calls a ""a stunning blast of exuberance and virtuosity." Tickets are $20 and can be purchased by calling 215-893-1999, online at www.kimmelcenter.org/global, or at the Kimmel Center box office open daily from 10am to 6pm and later on performance evenings. (Additional fees may apply.) For group sales call 215-790-5883. The duo, 2/5 of the Cleveland world music band, Harmonia (as well as members of the original Budowitz) will be playing a wild array of Eastern European folk music: balkan, Rom, klezmer. Boston Balkan music fans will know Walt from his many appearances at Balkan night. Steven, of course, is renowned for his Eastern European klezmer roots recording with Zev Feldman, Khevrisa, as well as his more recent, and stunning release, Stempenyu's Dream. Potent Contemporary interpretations of Gypsy music. Megitza Quartet, based out of Chicago, performs energetic renditions of Roma and Eastern European folk music. Beautiful melodies and rhythmic variations on their debut album “Boleritza,” turn the listening experience into a fascinating journey. Tapuach beDvash play "Rhythms of Fire"
"It may not be the oldest music in the world, but the sounds of the Roma, or Gypsy people, are certainly the most traveled, covering thousands of miles in a journey that's lasted centuries, influencing, blending with and taking on the colors of the many places it's landed along the way…." All colors of Gypsy music in the new program of Tapuach beDvash folk music band! "Rhythms of Fire" - Gypsy music from Romania, Macedonia, Hungary, Bulgaria, Russia. 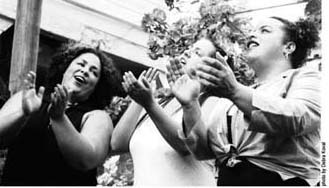 Kitka, meaning "bouquet" in Bulgarian and Macedonian, is an internationally-recognized women's vocal ensemble dedicated to producing concerts, recordings, and educational programs that develop new audiences for music rooted in Eastern European traditions. 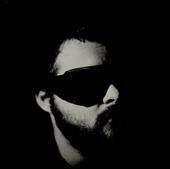 Kitka also strives to expand the boundaries of this music as an expressive art form. Yale Klezmer Band will be in concert with the Yale Women's Slavic Chorus, featuring members of the undergraduate and New Haven communities performing Russian, Ukrainian and Croatian music. Shirim returns to the Lily Pad in Cambridge on March 29, 2:00pm for another fun afternoon of great klezmer music! Last month we had a great crowd and the audience danced—including one dynamite kozatsky dancer! The Lily Pad is right across Cambridge St. from the S&S Deli, so you can grab a nosh before or after the show! Hungarian Rom virtuoso Kalman Balogh and his band with special guests Yale Strom & Elizabeth Schwartz. For an evening of dancing and klezmer/gypsy/world music, join hot local klezmer band Kugelplex at Ashkenaz, followed by Caspian Hat Dance from Amsterdam. The evening begins with a klezmer dance lesson with Bruce Bierman. West of Odessa, a Buffalo, NY/Hamilton, Ont. based trio will feature Moldavian/Ukrainian klezmer. The group includes clarinet, accordion, poyk and tsimbl. Karamfil, a performing group based in Rochester, NY features Macedonian/Bulgarian music performed on traditional folk instruments. This coming Saturday! Soulful, Groovin, Klezmer tunes and Wailin' Balkan gyration from Eastern Europe and beyond. Dancing encouraged! This will be our first appearance at a new music club in Freeport, VENUE. We'll be stretching out on klezmer tunes and rocking out on our growing balkan repertoire. We'd love to get a good turnout. Come celbrate Chanukah, the solstice, the end of the semester, or just having a good time on a Saturday night. Did I mention that it's only $5? Hope to see you there! This Paris-based sextet offers an irresistible invitation to participate in some of the most rhythmic and emotional sounds emanating from any part of the world. Part gypsy, part klezmer, this is the music that has moved people to sing and dance around the world for centuries. Klezwoods, an exciting Boston-based klezmer band, perform an energetic mix of klezmer, balkan, and arabic music with bass heavy grooves and eclectic instrumentation. Don't miss original Klezwoods Jeremy Gustin (drums) and Alec Speigelman (clarinet) as they return from Brooklyn for this special show! Greetings klez fans, be advised that there is a special show taking place in Inman Square at the Lily Pad, featuring the music of Klezwoods' own Tev Stevig, with fellow klez-mates Joe Kessler, Alec Speigelman, Michael McLaughlin, Greg Loughman, and Margaret Glaspy... Ladies and gentlement, Kafana! 7 Klezmer and 7 Gypsy virtuosos with roots in Europe. This presentation by The Other Europeans Band will take you on a journey into a fascinating past and present, with live music, a film of the band's research trip to North Moldova, and comparisons of klezmer and lautari (Roma) repertoire and style, and musical fireworks. Enjoy Klezmer and Roma in musical dialogue with anachronistic harmonies, barrier-breaking and devil-may-care tone. Come and celebrate the release of Gaucho's new CD release, Pearl, featuring guest vocalist Tamar Korn. n hesitez pas à passer nous souhaiter les voeux ! concert musique gypsy mediterranée et balkans! dans un café-resto sympa tout près de Republique ! Sunday 9 Jan at 9:00pm. The all-acoustic ensemble Kafana derives its name from a common term in the Balkans, meaning a place to happily gather to eat, drink, and listen to music. The group developed its repertoire over 3 years of weekly performances at a restaurant in Somerville, MA and play music from the Balkans, Greece, and Turkey in their own unique way. Kafana seek to combine elements from these musical cultures with their own varied backgrounds to create modern American folk music: a cultural mash-up of styles…. Also, please visit the new Klezwoods webpage to check out the details of the upcoming tour. featuring AHMET LULECI presenting folk dances of Turkey ! Miraculously funded by your generous voluntary donations—make one full-weekend contribution at Info Table in Great Hall or donate for each event you attend, but please DO YOUR PART to keep Folk Ball an open, free-flowing celebration! THANK YOU. Friday Night Dance Parties -- three of them! INTERNATIONAL DANCE: Great Hall (4th floor) 7:30-midnight. Presented by Madison Folk Dance Club (a UW Registered Student Organization). Sponsored by Department of Slavic Languages, College of Letters & Science. Welcomed by WORT 89.9FM Community-Sponsored Radio. Visit Joan Amsterdam's FOLKSTUFF SHOP in Great Hall anytime Saturday! 12-1pm Old Madison Room: Brownbag Lunch—"Tamburica, a Thriving Tradition"—Rick March & Members of "Do Zore"
Per person $17.50. Reservations required—accepted thru Sunday, Jan.16. Cafe-style tamburica music for dinner by "Do Zore" ! DO ZORE—The Milwaukee Sound from a New Generation! Admission: Free!. Age restrictions: No Minors. Every Sunday Morning, combining live music and food in a fresh, cultural environment, City Winery’s Klezmer brunch series pairs some of the greatest musicians in the world with delicious lox, bagels and other tasty fare on Sunday mornings from 11am to 2pm. City Winery's brunch on Feb. 20, 2011 features Klezwoods. Klezwoods and the Underscore Orkestra! Klezwoods come down from Boston. The Underscore Orchestra features Zev Zions and Aaron Alexanderwith Christian Dawid from Berlin! Klezmer and Yiddish Music returns to the East Village, where it once was king, at a new series curated by Aaron Alexander at the Sixth Street Community Synagogue. The lineup for the winter/spring series includes a fantastic lineup including wonderful klezmorim from New York and faraway places such as Montreal, Berlin, Boston, and the UK. Please come out and support the series! At 11 AM, join us for an open klezmer jam. Sheet music will be provided. And at 2:30 PM, Jacon Bloom will lead easy dances to klezmer music, which can be followed with a minimum of teaching. Mostly circle dances, such as the freylakhs, bulgar, slow hora, chusidl, and terkisher. Both events will have live music by the band Shver un Shviger. Three of the UK's acclaimed world music ensembles, Kosmos, Paprika and She'Koyokh, come together to celebrate These Lands Are Your Lands - Southbank Centre's Festival of Britain weekend of traditional, folk and world music and dance. This exhilarating triple bill conjures up a heady mix of Balkan and Latin grooves, Jewish and Gypsy passion, and soulful Arabic improvisations. Sixteen world-class musicians - one unique, unforgettable evening. The Purcell Room at Queen Elizabeth Hall. All Ages. The Underscore Orkestra is agian joining forces with Klezwoods for a night to remember. Come out, bring your friends and get ready to party!!! Subterranean Art House 2179 Bancroft Avenue, Berkeley 9pm (doors open 8:30) $10-$15. For years, they have played music from the five corners of Europe and beyond. Their performances are rare and very good. Panacea plays a delightful East European and Roma-Balkan dance mix, with group vocals. The all-star ensemble takes on impossibly challenging Eastern European rhythms, the kind that drive dancers to ecstasy. Acclaimed accordionist Nada Lewis is joined by hammered dulcimer player Robin Petrie (from such bands as Carnahan and Petrie, and Party of Seven), Shira Kammen (founder of Ensemble Alcatraz and music director of the Revels) on violin, top middle east percussionist Mark Bell (Helm), and vocalist Bon Singer (a founder of Kitka). 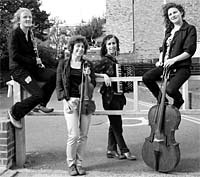 "Le Bal des Trespasses" is a french music group with influences yiddish and klezmer, and also great singers and group as Jacques Brel or Goran Bregovic. Sunday 16 October - Porters Wine Bar, 4-6pm. Our first appearance at this popular venue in Hastings Old Town. Hope we'll all fit into the tiny space. We have a couple of mellow yet lively sets lined up for this. Saturday 22 October - The Queen's Head, Landgate, Rye, starts 8.30pm. We return to this lovely old pub, reports of whose demise have turned out to be unfounded. Merita Halili thrills audiences with her masterful rendition of Albanian folk music. Known in her homeland as the "Queen of Albanian folk songs" and highly esteemed for her stunning voice, range and vocal technique, the award-winning vocalist is accompanied by her husband, Raif Hyseni, whose innovations and compositions for accordion have garnered praise for his "speed demon accordion." With an ensemble that also includes clarinet, guitar, keyboard and percussion, Merita Halili and Raif Hyseni will astound you with their vocal and instrumental artistry. 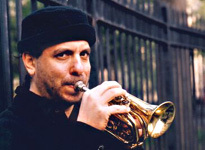 The Michael Winograd Trio, with Patrick Farrell, Benjy Fox Rosen and Michael Winograd, features three major voices in the international contemporary Klezmer community. Performing new music and reimagined traditional and folk music, this ensemble aims to present a fresh way of listening to and enjoying the rich genre of Yiddish music. Drawing on a variety of influences, Winograd's new trio provides a full and genuine experience of Klezmer and Yiddish song. Dr. Joel Rubin, clarinetist, said, "Perhaps the leading voice of the younger generation of performers and composers within klezmer." NOTE: There will be a participatory workshop the following afternoon, on Sunday, November 20th. More details will be posted when available. Within the provocative world of the early twentieth century urban Greek Café Amans, where flamboyant characters sang about desperate love, life and death, and the seedy side of life, there were a surprising number of celebrated Greek Jewish female vocalists. Included among them were Roza Eskenazi, one of the most renowned Greek singers of all time, and Stella Haskil, who sang together with legendary performers such as Vasilis Tsitsanis. On this side of the Atlantic, Jewish women, notably Amalia Baka and Victoria Hazan, found center stage in the immigrant Greek nightclubs and community celebrations of major urban centers, as well as within the American ethnic recording industry. All four women were held in high esteem for their extraordinary singing of a beautiful and complex repertoire, both during their lifetimes and again in recent years. Their music, making use of Eastern scales and asymmetrical rhythms, lush with intricate embellishment, and profound in its emotional content and depth, found its way into the hears of several generations of devoted listeners. Although widely embraced for their musical contributions to urban Greek cafe music and Rebetika, their histories as Jewish women are not widely known. Using live performance and excepts from personal and family interviews, acclaimed vocalist Carol Freeman, together with virtuoso instrumentalists Haig Manoukian (oud) and Beth Bahia Cohen (violin), pay tribute to these Greek Jewish singers with a fascinating look into the songs and lives of these extraordinary women. St Ethelburga's Centre, 78 Bishopsgate, London EC2N 4AG. St. Ethelburga's are delighted to welcome back She’Koyokh once again. This fabulously gifted Klezmer band, at ease performing in any environment. Inspired by the confluence of Eastern Europe’s musical cultures and traditions, this international ensemble have forged a sound straight from London’s melting pot - an exceptionally diverse repertoire of exhilarating, soulful Eastern European Jewish, Balkan, Turkish and Gypsy music. This fabulously gifted Klezmer band, at ease performing in any environment. Inspired by the confluence of Eastern Europe’s musical cultures and traditions, this international ensemble have forged a sound straight from London’s melting pot - an exceptionally diverse repertoire of exhilarating, soulful Eastern European Jewish, Balkan, Turkish and Gypsy music. $15-$30 suggested donation, no one turned away for lack of funds. Hear the mellifluous True Life Trio (featuring Leslie Bonnett and Briget Boyle of Kitka, & Juliana Graffagna of Janam) weave sumptuous vocal harmonies and sultry rhythms from Eastern Europe, the Americas & beyond. 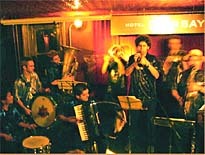 Then dance to the beautiful and bumpin’ big brassy Balkan beats of Inspector Gadje! The evening will also feature collaboration between the two groups. Light Chanukah candles (BYOC - Bring your own Chanukia and candles), nosh, and dance on the third night of the festival of lights. This concert opens with the debut of a new klezmer brass band featuring members of Inspector Gadje. The evening will close with a virtuosic performance of Turkish-Romani/Bulgarian music by drummer and vocalist Rumen 'Sali' Shopov and clarinetist Peter Jaques (of Brass Menazeri). Special edible treats by the extraordinarily effervescent culinary superstar Shayna Marmar (of Honeypie Cooking). Albanian, Bulgarian, Romany (Gypsy), Macedonian, Serbian, Greek, Turkish, Hungarian, Norwegian, Klezmer, Ukrainian, Georgian music, and more. New York's largest Balkan music event celebrating its 27th year with multiple stages, Balkan & Middle Eastern refreshments, Balkan arts vendors, as well as beautiful Balkan textiles on display. From international stars to local musicians, modern Balkan stylists to folk traditionalists, over 50 bands provide hours of ecstatic listening, dancing and partying. The Friends of Sacred Landmarks Initiative invite you to join them at a Russian New Year’s Eve Celebration on Saturday, January 14, 2012, in the Spitzer Conference Center Grand Room. The celebration will begin at 6 p.m., with dinner and dancing into the night. Enjoy music provided by Harmonia, and dance to folk music from Russia, Ukraine, Hungary, Slovakia, the Balkans and many other countries in the heart of Europe. 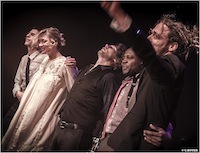 To learn more about this amazing ensemble, visit their website www.harmoniaband.com. There will be door prizes, raffles and much fun for all! Tickets for the celebration are $50 per person, or two for $95. To order tickets, please call the Sacred Landmarks Initiative office at 440-366-4590 during our office hours M-F 10 a.m. to 3 p.m. or leave a message with your name and number, and they will return your call. There will be a cash bar at the event; Spitzer Conference Center does not permit guests to bring outside alcohol. A menu is available on request for those with specific dietary needs. We are returning to one of our favorite venues, Johnny D's Uptown (Davis Sq., Somerville) for a show that will surely be remembered. We always love to play at this classic Somerville spot and are continuing the tradition of providing stellar and entertaining opening bands for the show. 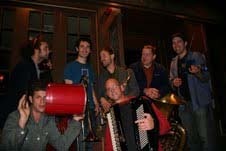 Last Spring we brought the Underscore Orkestra gypsy band from Oregon, this fall we had the Elephant Wrecking Ball, and this time around we are getting the Trubaci Balkan Brass Band! They will start the show off with a blast of brass that will surely get the party started right! They mix traditional eastern european flavors with intense improvisation and tight rhythms and harmonies. Trumpets, saxophones, trombones, tubas and drums will be blowing the roof off. Following Trubaci, Klezwoods will be rocking the house with our usual Klezmer/Eastern European blend of hard grooves, improvisation and melodies. This is a particularly special show for us, as we will be hitting the studio the very next day to record our next full length album! We will be travelling up to Syracuse, N.Y. for a weekend of recording at More Sound Studios. We are very excited to get rolling on this one, as it will feature a lot of new and original material as well as some classic repertoire that will make for an interesting and fun album to listen to. So come out and see us off with a night of great music, food, drinks and company! We hope to see you out this Thursday night! The Moors will make its Brighton debut on Sunday 6 May at The Brunswick, 1-3 Holland Road, Hove BN3 1JF. Tickets cost £6 (£4 concessions) and can be purchased online in advance. They will be launching their debut album, The Moors, that weekend! *Also special performances beforehand by Balkan Café at 8:30 PM and afterwards by the Zlatne Uste brass! OFFICAL NYC HARMONIA CD release party & Vechornytsy! A rising star of the Brooklyn music scene, Joey Weisenberg pays homage to his roots. His ensemble puts a new spin on nigunim – Jewish melodies, prayers and chants that are by turns haunting and ecstatic – organically blending Balkan, soul, bluegrass, and other musical traditions. The historic Eldridge Street Synagogue is the perfect venue for this inspired blend of ancient and cutting edge. This concert continues the Museum's fall Lost & Found Music Series highlighting the sacred music traditions of the Golden Age of Cantorial Music. Mahall's 20 lanes, 13200 Madison, Lakewood, OH 44107. The Gypsy Cellar, Settler’s Tavern, and the Two Cro’s may have passed from the scene in Cleveland, but Harmonia brings the spirit of a Gypsy Café back for a night of music and dancing on Saturday December 8th. An intimate candle lit setting, a glass of wine, and the sound of virtuoso violin and cimbalom and Beata's soulful vocals; what could be a better way to kick off the holiday season? As usual, Harmonia will play music from all over Eastern Europe: Hungarian, Slovak, Gypsy, Carpatho-Rusyn, Ukrainian, Croatian, Serbian and more. The concert and dance party takes place at Mahall's 20 Lanes located at 13200 Madison Ave., Lakewood OH 44107. Tickets are $10.Music begins at 8 PM, doors open at 7. For information and reservations call Mahall's at 216-521-3280. Mahall's features delicious, reasonably priced food and excellent drinks as well as a great line-up of music. There is plenty of free parking. Copies of Harmonia's latest CD, Hidden Legacy, will be available at the concert. Join us December 8th for an unforgettable evening of music and and dancing! Tsimtsoum, du nom issu des traditions mystiques de la Kabbale, qui puise dans le répertoire klezmer et balkanique , en mèlant influences issues du classique , du jazz du folk , du blues ou de musiques ethniques. Une invitation au voyage et à l’imaginaire. Mashké : quatre musiciens aux origines et univers différents, animés par l’envie d’injecter dans le répertoire traditionnel des musiques juives d’Europe centrale, leur propre réalité et d’autres sonorités. C’est la volonté de mêler les mots et les langues, d’allier cultures et territoires hétérogènes, de revisiter et réinterpréter ces magnifiques mélodies. Mais c’est avant tout une invitation au partage, à la danse et au chant tout autant qu’au rêve, à l’émotion et à la réflexion. Bon FESTIVAL KLEZMER KAOS à L'ENTREPOT ! Enchanting, virtuosic, ornate – Ismail Fencioglu is a true master of Turkish music. He has mesmerized Canadian, European and Turkish audiences with his fleet-fingered oud playing, soaring tenor vocals and encyclopedic knowledge of the classical Turkish music repertoire. A graduate of the State Conservatory of Istanbul Technical University, he has performed throughout Turkey both live and on television with other masters of the genre, including Alaeddin Yavasca, Bekir Sidki Sezgin, Erkan Ogur and Tulin Yakarcelik. Residing now in Montreal, Canada, Ismail has partnered with high-energy, blues-rock inspired klezmer group Shtreiml to perform a set of "Turkish Roots & Jewish Blues." Through compelling original compositions and new arrangements of traditional folk melodies, the ensemble explores the ancient connections between Jewish and Turkish music. Joined by harmonica innovator Jason Rosenblatt (harmonica, keys), Rachel Lemisch (trombone), Thierry Arsenault (drums) and Joel Kerr (bass) the group's set has been labeled "explosive" (Halifax Chronicle Herald) and "exhilarating" (Rootsworld). Please join us to dance and sing together! Klezwoods Great North Weekend Getaway Tour! Romashka (my gypsy dance party band) has sprouted at least 6 kids in the years of its existence, so it's about time we pay attention to our youngest fans. We're gearing up to play our first-ever multi-generational ROMASHKA JR. family show on the rooftop at JCC Manhattan as part of the Generation R family series. In addition to the ever-potent fare of gypsy, klezmer, folk and retro music from Russia, Romania, the Balkans and beyond, Romashka will dig into Russian cartoon music, musical games and stories for the youngest Romashka fans. At full blast, Romashka has a violin, viola, accordion, guitar, trumpet, clarinet/saxophone, tuba, and percussion. Pack your dancing shoes. All ages welcome. Bring your friends, parents, grandparents, near and far. "Bring-Your-Own-Chairs" and enjoy a night out at Washington Square with your family, friends, neighbors and dogs!! This is an annual festival put on by Foundation for A Green Future, Inc. It's the biggest multicultural environmental music festival in the Northeast and the ensemble is honored to be playing again for such a good cause. They will be playing a 30 minute set and is one of many talented acts throughout the weekend. Go Green! This workshop will teach students to sing the magnificent vocal repertoire of early 20th Century Asia Minor Greek artists with authenticity and ease. By learning how to carefully listen to excellent recordings and how to then access one's memory of these songs, and by learning simple tricks to make singing them effortless, students will easily learn to sing an involved repertoire with comfort, clarity, and control. Students will begin to master the art of singing intricate ornamentation, complex rhythms, and microtonal scales, in a process that is fluid and fun. Students will also learn tricks for seamlessly switching between vocal placements without detection, and for producing optimal tone. We will also learn how to phrase songs so as to provide for maximum depth of expression, artistry, and musicality. The songs, which follow the complex system of microtonal scales known as makam in Turkish or dhromi (roads) in Greek, have simply gorgeous melodies, and are lush with embellishment. The 1920s -1930s texts leave no stone unturned, and deal with scorching love, unbearable pain, cocaine, hashish, and heroine, lesbianism, monkey serum fountain of youth injections, harem girls, Hawaiian guitar music, and anything else one may fancy. Though the repertoire is challenging and instruction is detailed and specific, the workshop will be taught in a supportive, comfortable and relaxed setting, and is always fun. The workshop is open to everyone and no prior experience with the reperotire or language is necessary. Well known as a performer, researcher, and teacher of a variety of Greek, Judaic, Balkan, and other singing traditions, Carol Freeman has performed since 1970 as vocalist for The Smyrneiki Kompania Asia Minor Greek Music Ensemble, Sevda Balkan Music Ensemble, Song of the Shtetl Jewish Music Ensemble, and Zhenska Pesna (Balkan women’s trio), and as a solo interpreter of traditional song, and has appeared at arts centers, music festivals, museums, universities, folklore seminars, synagogues, and community facilities, and on radio and television, throughout North America. She learned much of her repertoire by conducting extensive research with Old World singers both in Europe and the US. An expert vocal instructor, Carol Freeman has taught classes, workshops, and individual lessons, both as a private instructor and at public and specialized arts schools, music seminars, universities, and museums for four decades, and has also done extensive vocal coaching with noted choirs, theater companies, and folkloric performance ensembles. Naftule’s Dream is playing a set this Saturday night, Oct. 26, at 10:30 at the Lily Pad in Inman Square, Cambridge (1353 Cambridge St)! It is a triple bill with Klezwoods & Jeni Jol. Jeni Jol starts at 9:00, we go on at 10:30 and Klezwoods at 11:45. Jeni Jol performs music of The Balkans, Greece and Turkey as a duo led by virtuoso guitarist Tev Stevig. Klezwoods will close the evening with traditional and original music based off the Klezmer, Eastern European and Arabic styles with modern improvisation, grooves and melodies. And you know what we do! Klezwoods is performing for Jewish Heritage Night at the TD Bank Garden for a Celtics game on December 3rd from 6:45-7:30pm. This is the band's first performance at a pro basketball game, and it's for our boys in Green! Go Celtics! The band is playing a Hannukkah program for this concert series. 2 sets of music with an intermission in the middle at a lovely location. They will be pulling out some klezmer classics as well as original and more obscure repertoire for this one. Klezwoods is teaming up with our friends from Brooklyn, Karikatura, and Fat Bradley (funk from Northampton) for a night out in Noho! This is the group's second adventure to Northampton and we hope to make it a good one. Great song and dance in Western MA! It's that time of year again! 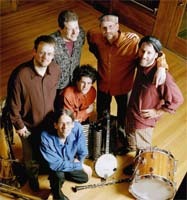 The ensemble is returning from whence it came to perform two sets of "Bar Klezmer" that made the band what it is today. Get ready to celebrate the holidays...Klezwoods style! Friday, January 17 and Saturday, January 18: CTMD is pleased to be a media sponsor of Golden Fest, New York's biggest Balkan music event and showcase, back in Brooklyn for its 29th anniversary at Grand Prospect Hall, a spectacularly restored historic landmark in Park Slope. The festival, which is sponsored by the Zlatne Uste Balkan Brass Band, runs from 7:30PM - 12:30AM on Friday and then 6:00PM on Saturday until early Sunday morning. Last year's festival boasted over 70 separate performances, Saturday on 4 concurrent stages. Groups played and sang Albanian, Bulgarian, Romany (Gypsy), Macedonian, Serbian, Greek, Turkish, Norwegian, Klezmer, Ukrainian, Georgian music, and more. All the musicians volunteer their time. Profits are donated to charitable or educational organizations serving Balkan cultures and communities. Zlatne Uste Balkan Brass Band (www.zlatneuste.org) founded the Golden Festival in 1986 and has sponsored it ever since. Grand Prospect Hall, 263 Prospect Avenue, between 5th and 6th Avenues in Brooklyn. Complimentary Balkan & Middle Eastern Snacks/Cash Bar. For tickets, admission prices and more information go to the festival website. "Folk Harmonies of the Balkans"
Once again the ensemble of rag tag Klezmer/Balkan ruffians are heading out to the birthplace of the American Revolution (Concord, MA) for Balkan Night 2014. Celebrating the music of the Balkans, FPAC put together dozens of bands performing 20 minute sets of music from different regions of Eastern Europe. The concert portion will be from 7-9, followed by a all night dance party until 3am! Klezwoods is playing a night of Balkan inspired music for the concert. It's not a night you want to miss...trust us! The Sarajevo Haggadah: Music of the Book, composed by Bosnian-born accordionist Merima Ključo, traces the incredible journey of this most treasured manuscript that was smuggled from Spain during the Inquisition, hidden from Nazis during WWII by a Muslim librarian, saved from the ravages of the 1992 Bosnian War, and eventually restored to the National Museum in Sarajevo. Inspired by the musical traditions of Spain, Italy, Austria, and Bosnia-Herzegovina, Ključo collaborates with pianist Seth Knopp and artist Bart Woodstrup to create a multimedia performance exploring the Sarajevo Haggadah as a symbol of diaspora and return. The work is the 2013-2014 New Jewish Culture Network’s commission and touring project. Produced in partnership with New Center LIVE, stay for a post-concert discussion with Merima and Geraldine Brooks, author of People of The Book, the historical novel that inspired this production. Reserved Seat Tickets: $36 (includes post-event reception), $25, Students: $15 are available by clicking here. You are invited to a screening of a powerful Canadian documentary and talk with director, Aaron Yeger. The film deals with the Roma people, commonly referred to as Gypsies, who, like the Jews, faced annihilation during the Holocaust. This film documents their culturally rich, yet often difficult lives, and how their current condition has been shaped by the tragedies of the past. Paradox Trio (literal) will be starting a monthly residency at Barbes in Brooklyn this Thursday eve. The Goodnight Circus reiste früher radfahrend durch die Welt und verbindet Zirkus und Musik, vermischt Gypsy- und Klezmerelemente mit New Orleans-Jazz und Rock’n’Roll, und macht daraus anarchisch-swingige Tanzmusik. Schräg, wild und authentisch – ein Geheimtipp aus dem Berliner Untergrund! 4 nights every Sunday in April. Klezwoods is bringing in a different supporting artist every week for themed shows and will be working on new original pieces by different band members. 9:00 - Eva Salina Primack - "Eva’s rich, versatile, agile, deep and powerful voice and her enthusiastic, skillful, inspired and inspiring teaching have led her to quickly become a reknowned singer, interpreter, and teacher of Traditional Balkan Vocal music." As Grammy-winning violinist and song writer for The Klezmatics, Gutkin has consistently proven a masterful musician. But fans who have only witnessed her within the context of the Klezmatics have experienced just a fragment of what this multi-faceted artist is capable of producing. She might swing seamlessly from traditional Irish fiddle tunes to blues, Balkan or Appalachian sounds. Or she might put the violin down altogether, pick up a tenor guitar and sing one of her own universally resonant songs. Wherever she goes Gutkin has an uncanny way of taking the audience with her. 10:30 - Dolunay NYC - Dolunay (Turkish for “full moon”) plays the songs of the people of Turkish descent who lived across Rumeli, the southern Balkan region of the Ottoman Empire. Dolunay brings new life to the timeless songs and melodies of this region, known for its rich cultural diversity. Based in Brooklyn, the group features top-notch musicians from the NY music scene. Bobby Spellman's Underground Society Band with Cocek! Merita Halili is one of Albania’s top performers, renowned for her stunning voice, prodigious range and exquisite vocal technique. Raif Hyseni, originally from the Republic of Kosova (which recently declared its independence from the Serbia after 100 years), leads the most sought-after Albanian music ensemble in the United States. Together their performances offer masterful interpretations of instrumentals and urban folk songs from both Albania and the Republic of Kosovo. Recent performance highlights include engagements at The Kennedy Center, The Lied Center of Kansas, New York’s Lincoln Center, and London’s famed Barbican Cantre. Lahore meets Brooklyn where the Hudson flows down from Himalayan headwaters. A magical world of global sounds comes alive when superstar Pakistani vocalist Zeb Bangash joins forces with a retinue of leading Brooklyn musicians led by clarinetist/composer Michael Winograd to unlock the secrets of Pakistan’s traditional musics – a culturally diverse region conjuring cosmopolitan Silk Road cities, ecstatic mystics, Dravidian settlements lost to the sands of time, as well as the contemporary complexities of post-colonial nationhood. SANDARAA explores a vast repertoire of South Asian musical traditions while blending it with the sounds and sensibilities of Eastern Europe, the Balkans, and Brooklyn! Hailing from New York City's bustling streets, Tavche Gravche brings forth a fresh take on traditional Balkan tunes, as well as evocative originals by the group's members. Macedonian-born and Juilliard educated, clarinetist Vasko Dukovski is a concert performer dedicated to breathing new life into the music of his roots. Steeped in both jazz and flamenco, Israeli-born guitarist Dan Nadel provides the fiery textural and harmonic palette for the band's music. Jazz bassist Daniel Ori, also from Israel, is the quartet's founder, and his luxurious sound is its foundation. Master Macedonian percussionist Aleksander Petrov graces the stage with his magic and frees the entire band to go beyond their unique blend of sounds, cultures, rhythms, colors, and become an all-encompassing adventure for the listeners and themselves. TavChe GravChe blends haunting Macedonian and Mediterranean melodies in a dynamic improvisational atmosphere, maintaining the explosive dance-able rhythms and energy of the Balkan music. While only working together a short time, the quartet has already created an impressive itinerary of NYC performances, including a center stage concert at the city's 2013 annual Balkan Festival. Haunting vocals, swirling clarinet and sax melodies soar over powerful accordion cascades, dizzying guitar solos, and irresistible Balkan beats. Four veteran musicians come together for a night of soulful songs and high energy dance music. Don't miss this Balkan cabaret;come party with us the way only people from the Balkans know how! Come dance your favorite ethnic dances: Învârtita, Sârbă, Horă, Csárdás, Kolo and much more! Don’t know how? There will be Romanian dance teaching in the afternoon! For more information Contact: 330-666-8054; Visit www.festivalofspring.org for details and diretions. Prepare for a dance party with the Baladi Blues Ensemble as you've never seen them before: in an on-stage collaboration with members of the legendary Transglobal Underground and Kamel Nitrate. Followed by a full-on DJ set! Non-stop dance music from 8 till late. Saturday, June 21 HARMONIA returns to Simply Slavic Heritage Festival in downtown Youngstown - details at www.simplyslavic.org THIS IS AN EVENT NOT TO BE MISSED! Celebrate the Hungarian and Slovak heritage of one of Cleveland's greatest old ethnic neighborhoods! Contact Mark Zamiska (216) 381-2685 for more information. The harmonic, rhythmic and tonal richness of Gypsy and village music from east of the Danube are channeled by this "musical gem" (National Public Radio). E-mail Beth Bahia Cohen for registration. Maximum 10 students. Das Duo "Michael Riessler & Pierre Charial" tritt in der aussergewöhnlichen Kombination Bassklarinette und Drehorgel auf. Michael Riessler gilt als Deutschlands führender Grenzgänger zwischen moderner Klassik und zeitgenössischem Jazz, hat sich längst international etabliert. Seit vielen Jahren arbeitet Riessler mit dem französischen Drehorgelspieler Pierre Charial zusammen, der seiner lochkartengesteuerten Orgel ein bizarres Feuerwerk von Klängen und Soundcollagen entlockt. Charial, der in Paris lebt, spielt eine lochkartengesteuerte Drehorgel des Pariser Drehorgelbauers André Odin mit 42 Tasten 114 Pfeifen und 3 Registern. aus 6 Klarinetten und 6 Kulturen! DIE EINTRITTSKARTEN SIND FÜR DEN GESAMTEN ABEND GÜLTIG UND BERECHTIGEN ZUM BESUCH BEIDER KONZERTE! Karten erhältlich an allen AdTicket und Reserix VVK-Stellen! Klezmer/Balkan mashup dance party Friday, December 19 Subterranean Arthouse, 2179 Bancroft Way, Berkeley, CA Free. 7pm potluck, open mic, and dance party starting around 9pm. This event celebrates 6 years of the Arthouse. coming up soon, make sure to come for the early klezmer set Sat night ... 6:45pm and the Yiddish "Zingeray!" at 8:45. 60 bands! Tentative performer line-up on the website. Discounted advance tickets on the website. Celebrate International Women’s day with the internationally renowned, Oakland-based women’s vocal ensemble showcasing new Jewish music and traditional music of Eastern Europe. A local treasure, Kitka’s stunning dissonances, asymmetric rhythms, and lush harmonies will transport you to another world. Book of J (Jewlia Eisenberg and Jeremiah Lockwood) will play songs from Armenia, Bosnia, Poland, and America. Kugelplex will collaborate with poet James Baloian on a piece about the Armenian genocide and the perseverance of the Armenian people. James Baloian is a poet who for over fifty years has been writing and publishing poetry that explores the beauty, cruelty, dreams, fears, turbulence, and serenity of human existence and the natural world around us. A selection of his works has been set to original and traditional music that pays homage to the far-reaching tragedy and trauma of the Genocide as well as the love and perseverance of the Armenian people. We are embarking on a weekend artist-in-residency in Connecticut! In the town of Madison, near New Haven, there is a beautiful temple that has invited the ensemble to do 3 performances. Friday night Klezwoods will perform at the service. On Saturday at 7:30pm the larger ensemble will put on a concert. And on Sunday morning they will put on a Children's program playing traditional and new Klezmer/Eastern-European music, teaching about the roots of this music and where it is going. Balkan, gypsy, klezmer, Russian music - even a bit of Turkish or Greek.... come and share your tunes at the 2nd Thursday East European jam, downstairs at The Harrison from 8pm every month with house band 'Bucimis Trio' (Susi Evans, Matt Bacon and Chrisina Borgenstierna). The Glasshouse Ensemble is named for the Hungary’s legendary Glass House (Üvegház), the most famous among 76 safe houses established around Budapest by the Swiss diplomat Carl Lutz, where thousands of Jews took refuge during the Holocaust. Glasshouse Ensemble is made up of American and Hungarian musicians led by Grammy Award-winning trumpeter, bandleader and composer Frank London of The Klezmatics. The repertoire features a selection of long forgotten songs from Central Europe’s Jewish past. Tix: $36 per person, available online. Use the promo code 'muszik' when purchasing tickets online for a 25% discount. playing klezmer and East European music for the Stanford International Folk Dancers. Join the Somerville Symphony Orkestar for a great night of our Klezmer influenced international party music! Shtreiml & Ismail Fencioglu perform an innovative program of music rooted in the Ottoman and Jewish traditions brimming with hard-rock sensibilities and dexterous improvisational know-how. It is replete with fleet-fingered oud playing, fiery harmonica brilliance all powered by their rhythm section's incomparable Balkan flair. In 2014 they were nominated for a Canadian Folk Music Award. There are many excellent performances touching on klezmer, Yiddish, Jewish and Israeli influences, including a Klezmer extravaganza on Monday. San Francisco's "Best Crazed Brass Band Dance Party." This music touches the heart, stirs the soul, and moves the body. Inspector Gadje's collaboration with Macedonian master clarinetist Ismail Lumanovski take this music to new heights! Advance tickets to this all-night sweat soaked dance party are highly recommended. 2nd Thursday of every month, 8-10.30pm on the Ground Floor. Harmonia in an evening of Gypsy, Hungarian, Romanian, Croatian, Ukrainian, Slovak and Carpatho-Rusyn music. On February 14 from 11am-12pm, Harmonia will be at Herrick Memorial Library, 101 Willard Memorial Square, Wellington. Advanced reservations recommended. Call 440-647-2120. On February 17 from 11am-12pm, the group will perform at Kendal at Oberlin, 600 Kendal Drive, Oberlin. Advanced reservations recommended. Call 440-775-0094. Harmonia in an evening of Gypsy, Hungarian, Romanian, Croatian, Ukrainian, Slovak and Carpatho-Rusyn music. On February 17 from 11am-12pm, the group will perform at Kendal at Oberlin, 600 Kendal Drive, Oberlin. Advanced reservations recommended. Call 440-775-0094. This is a community-wide free concert, presented by Ohio Regional Music Arts and Cultural Outreach (ORMACO) with generous underwriting from The Ohio Arts Council, The Wellington Foundation and Nordson Corporation. Harmonia in an evening of Gypsy, Hungarian, Romanian, Croatian, Ukrainian, Slovak and Carpatho-Rusyn music. This diverse folk band will present an evening of passionate and intricate music. In addition to the community concert, Harmonia will also offer two free workshops during the week. On February 14 from 11am-12pm, Harmonia will be at Herrick Memorial Library, 101 Willard Memorial Square, Wellington. Advanced reservations recommended. Call 440-647-2120. On February 17 from 11am-12pm, the group will perform at Kendal at Oberlin, 600 Kendal Drive, Oberlin. Advanced reservations recommended. Call 440-775-0094. She'koyokh album launch, "First Dance on Second Avenue"
You can dance all night in the spacious dance hall, or you can settle into the concert seating of the intimate upstairs "kefana" (kefi = elated mood) and listen to acoustic performances by some of the finest Balkan musicians around! Dinner reservations guarantee seating. Call 416 588 0307 to reserve your table. All profits from ticket sales will go to Romero House which houses four refugee families and offers community meeting space to organizations such as PEN Canada and Latin American Solidarity groups. Joignez-vous à nous pour une soirée de style cabaret pendant lequel il nous fera un grand plaisir de vous interprèter nos mélodies préférés du répertoire Roumain, Ukrainien, Lituanien, Russe et Klezmer. Music by Zlatne Uste Balkan Brass Band and more! French violonist and singer Eleonore Biezunski has been exploring the Yiddish traditions of the old and new world for quite some time now – both as a musician and as a archivist for YIVO. For this new project, she will be joined by Lauren Brody (vocals, accordion). Lauren Brody, a founding member of both Kapelye and Mikveh, is one of the world’s foremost experts in traditional Bulgarian music, and her singing and accordion-playing in Yiddish performances is legendary. She travels the world as a bearer of Yiddish musical tradition.